Just outside my front door there is an untidy patch of Green Alkanet. It’s not the ideal place for this rather scratchy plant to grow, but I cannot bring myself to dig it out, because it’s a favourite spot for some black and yellow caterpillars to feed. As a result, every summer there’s a day when I open the front door and get treated to the breathtaking sight of a newly emerged Scarlet Tiger moth – just fabulous. Each year the first of these glorious moths surprises and amazes me, even though it’s been a regular experience since Scarlet Tigers colonised our vilage in 2009. It’s still a mystery to me how they first arrived: as far as I know there were no nearby colonies. Whatever the source, they are very welcome. And this freshly hatched pair had wasted no time in getting to know each other – hopefully that bodes well for another Scarlet experience next summer – definitely one of life’s joys. Today saw the first reasonably heavy snowfall in our part of the Chilterns for quite a while, so we couldn’t resist heading up the hill for some sledging and to visit BBOWT’s Grangelands reserve. The air was crisp, and the snow-enveloped landscape was beautiful. I wasn’t really expecting to find much insect life to watch, so was surprised to see a small caterpillar crawling across the top of some fairly deep snow. At first I thought this must be a one-off oddity, perhaps dropped onto the snow by a bird or carried there by the wind, but then I started seeing others. I found eight in a short space of time, all seemingly happy to be out and about on the surface of the pristine snow. The dark speck in the lower middle of the photo is a caterpillar! On closer examination at least some were caterpillars of the Large Yellow Underwing moth (Noctua pronuba), a well-known and very abundant species in the UK. I hadn’t been aware of its habit of being active in such conditions, but a web search leads to a number of American reports of similar snowy adventures for this species (see this post by Vermont naturalist Mary Holland for example, plus some additional photos on BugGuide). Large Yellow Underwing is an introduced species in America, and can be a pest species. Its winter activities are so well-known there that it also goes under the name of Winter Cutworm or Snow Cutworm. I’ve always had a sneaking admiration for how well Large Yellow Underwing manages to survive in the modern world, but I’m even more impressed by its hardiness now! Has anyone else seen this snow-walking behaviour in the UK? What happens on a moth course at Bushy Park? What happens? Lots of things! We’ll be opening a moth trap, sorting moths into their correct families, studying the niceties of species identification, exploring woodland, meadows and hedgerows for moths by day and by night, joining in with quizzes and exercises, and much more. If you’ve ever wanted to find out more about how moths live, what role they play in habitats and food chains, and how to observe them for yourself, this is your chance. This course runs on Saturday 14 May 2016 at Bushy Park in west London. It starts at 2pm with classroom and field sessions, and then in the evening we’ll head out with moth traps to put our skills into practice. Click here for full details and to book a place. 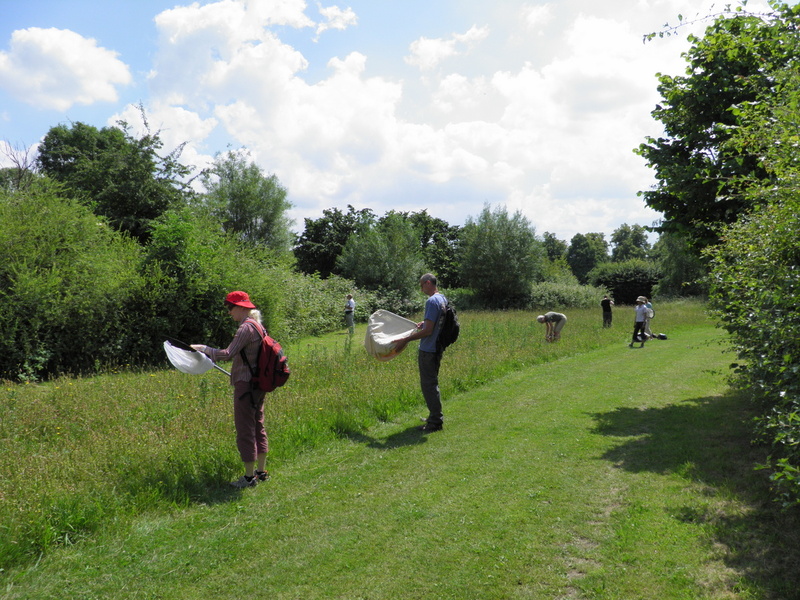 The course is based in a part of Bushy Park that is not normally open to the public, and allows access to flower-rich meadows, woodlands and wetlands. We’ll use a mix of classroom presentations, activities and fieldwork to help you get to know more about moths and what makes them special. You don’t need to know anything about moths already, beginners are welcome, and if you’ve already started taking an interest in moths the course will help you develop your knowledge further. Contact FSC to book your place, and come prepared to be amazed by moths. Last Sunday I attended the excellent annual conference of the Garden Moth Scheme, which was well-attended, informative and enjoyable. And most importantly it showed how valuable it can be to record in a slightly more standardised way that we might otherwise do. Read on for more on the benefits of structured recording, and how you can join in with GMS. Lots of people record moths and send their records in to their county moth recorder, which is an excellent way of finding out which species are where and contributing to the National Moth Recording Scheme. However, using this data for monitoring purposes is not straightforward, as there are so many variations in how, where and when people record their moths. To get good data on population trends for moths a more structured approach is needed. Mean annual catches of the longest running RIS trap (Barnfield), in 3 year categories, compared with average values for RIS arable and grassland sites. The largest-scale example of structured moth recording is the Rothamsted Insect Survey (RIS), which celebrated its 50th anniversary in 2014. One of the RIS projects gathers data from Rothamsted moth traps positioned around Britain and Ireland. The first of these traps was used in the 1930s and 1940s, and following a gap in the 1950s an extensive network has been developed since the 1960s. This has provided an unparalleled set of long-term monitoring data for moths, and unfortunately what the data tell us is not very good news: the one trap that was running before the second world war was producing a lot more moths than traps have done subsequently, suggesting that there was a major decline in moth abundance in the 1950s (see graph on right). And the declines have continued: Rothamsted data was used in a joint project with Butterfly Conservation to assess the State of Britain’s moths over the last 40 years, from which the headline news was that two-thirds of widespread moths have undergone a significant decline, especially in southern Britain. The Rothamsted moth traps are run by a network of volunteers, and new volunteers are welcome, but it is quite a big commitment. You have to have space to install the trap, and you have to commit to running it every night of the year for at least five years. Many of the Rothamsted traps are situated in places such as Field Studies Centres or research institutes. But there is another moth monitoring scheme that you can join in with much more easily. The Garden Moth Scheme asks its participants to run a moth trap once a week (on the same night each week if at all possible) and to record the numbers of a suite of common species (you can of course record all the species you see if you wish, but the GMS focuses on a main list of around 220 species). Even if the weather is unpromising it’s still important to run your trap, and if you have a night where you record no moths that is still useful data! It is this regular pattern of recording once a week whatever the weather that helps give this survey its structured data, and allows for robust analysis of the results. The GMS is an entirely volunteer-led project that has been running nationally since 2007, and the data it has collected is building up into a major resource. A recently published paper uses GMS data to show that gardens containing more diverse habitats have more moths, gardens near the coast have more on average than inland gardens, and gardens in urban areas have fewer moths on average than non-urban areas. These results are not perhaps very surprising, but the GMS data allows the trends to be quantified and investigated further. The full paper is open-access, see: Bates, A.J., et al. 2014. Garden and Landscape-Scale Correlates of Moths of Differing Conservation Status: Significant Effects of Urbanization and Habitat Diversity. PLoS ONE 9(1): e86925. doi: 10.1371/journal.pone.0086925. A previous paper looked at the effects of different designs of moth trap and different bulb types to compare the catches of each (Bates, A.J., et al. 2013. Assessing the value of the Garden Moth Scheme citizen science dataset: how does light trap type affect catch?. Entomologia Experimentalis et Applicata, 146: 386–397. doi: 10.1111/eea.12038 – unfortunately this one isn’t open-access), and members of the GMS are busy looking at the data in various ways to pick out trends and report back to the participants via regular newsletters and annual reports. Over time the data will become ever more useful and will allow for further research. 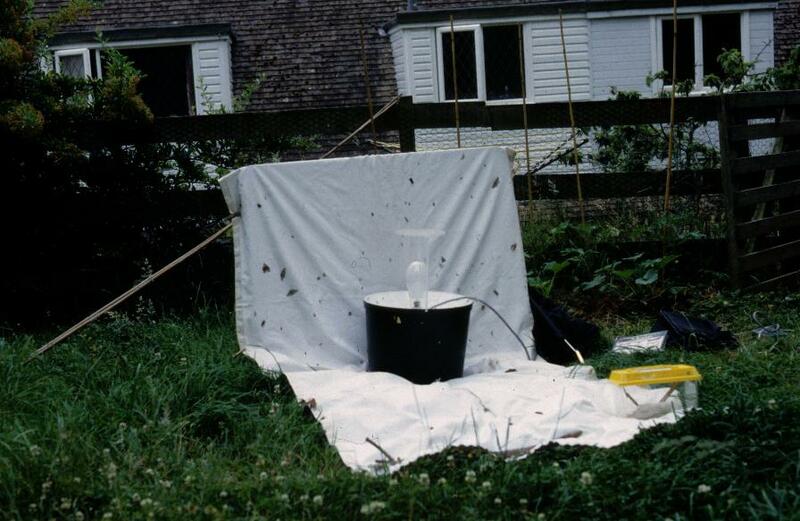 Moth trap in my former garden in Berkshire – sadly, where I live now is much less productive for moths! All in all the GMS is an excellent way for moth recorders to add an element of structured monitoring to their recording, without doing anything other than running a moth-trap in the garden, the sort of thing that moth-recorders love to do anyway! If you want to join in for the 2015 you need to be quick – recording is due to start this coming Friday 6 March (although at a push you can start a week or two later if you miss that first deadline), so head straight over to the GMS Getting involved page. I’m going to give it a go this year, and I look forward to seeing how my results fit in with everyone else’s. If you do take part in GMS, please remember to copy your results (along with all your non-GMS moth records) to your county moth recorder as well. Moths are in trouble – evidence is accumulating (see Butterfly Conservation and Conrad et al. 2006) to show that many moth species are in decline, especially in the southern half of Britain. But what are the causes? Research is showing that a combination of factors is likely to be involved (Fox et al. 2014), with habitat change or loss and climate change likely to be a large part of the story. But another factor that could be impacting on moths is ‘light pollution’, the tendency for humans to want their own habitat to be lit up at night, so we can work, play and feel safe walking the streets. The night-time glow of towns and cities is visible from miles away, and even in rural areas roads, shops and houses may be illuminated. Could all this light be affecting the lives of nocturnal creatures such as moths? It seems plausible, but it’s hard to prove, not least because the way most of us go out and look for moths is by putting bright lights out to attract them. How to find out what light pollution does to moths when they’re hard to observe in the dark? A newly published paper (“Artificial light at night inhibits mating in a Geometrid moth” Van Geffen et al. 2015) has used an ingeniously simple method to investigate this, and the results suggest that we should indeed be worried about what light is doing to moths. Koert van Geffen and colleagues carried out their study in the Netherlands, and chose Winter Moth as their subject. Why Winter Moth? One reason why they make good study subjects is that their habits are a bit more predictable than for many moths: female Winter Moths are flightless, and one they emerge from their cocoons under ground they ascend the nearest oak tree and wait for the males to find them. And there is an established method for trapping them, by setting up ‘funnel traps’ that steer the females into a container once they climb far enough up the oak tree. So Winter Moths are going to be climbing their oak trees, and if you shine a light on the tree the females can’t fly away. The Dutch team set up a series of different lighting regimes directed at oak trees, using green, white and red light, plus unlit trees for comparison. They counted the females on each tree, and checked them to see if they had mated. The results seem to me to be quite dramatic. By far the greatest number of female moths were caught from the unlit trees. Of the illuminated trees, white had fewer than red, and green fewest of all. All lit trees had more moths on the shaded side than the lit side, but only under red light did even the shaded side produce anywhere near as many moths as the unlit trees. And there was a big difference in mating success: 53% of females caught from the unlit trees had mated, but only 28% of the females under red illumination, 16% under white, and 13% under green. Van Geffen et al. also studied male moths using pheromone traps positioned under different lights. The differences here were less dramatic but still apparent, with fewest males caught under red light, more under white, more again under green, and the greatest number from unlit traps. This is of course just one study of one moth species, but it showed that in this instance artificial light reduces the activity of female moths, and also reduces the male response to female pheromones, resulting in decreased mating success. The lights used in the experiment were LEDs with a light intensity of 10 lux – street lighting can be much brighter than this, up to 60 lux (Gaston et al. 2012). Relatively simple and effective research, providing more evidence of the pressures on moth populations. Can we do anything to reduce the effects of light pollution? Gaston et al. 2012 review possible ways of preventing too much light escaping into the wider environment. Further useful information and advice is available from Buglife’s research and Campaign to Protect Rural England’s “Dark Skies” pages. For instance, we can reduce the intensity of artificial lighting, direct it more precisely so there is less overspill, and leave lights on for shorter periods so that they are only illuminated when they are actually needed. This not only has the potential to help wildlife, but to reduce energy use and costs as well – moving lighting in this direction has got to be a no-brainer. By taking action at home and encouraging local authorities and businesses to do likewise we can all help shed some darkness and take moths out of the spotlight. Spot spotted, or not spotted? The spot in question is Lempke’s Gold Spot, a rather lovely moth named after the Dutch lepidopterist, B.J. Lempke, who I believe was the first to discover this species in Europe (it had long been known in the USA). In Britain it’s mostly found in the northern half of the country, but there are a few records for the south. Earlier today, Roy Leverton (author of the excellent Enjoying Moths) contacted me, in my capacity as Berkshire county moth recorder, regarding a potential Berkshire record of Lempke’s Gold Spot. This was published in a note by R.F. Bretherton, in the Entomologist’s Record for 1966 (available via the Biodiversity Heritage Library). In the note Bretherton refers to discovering that a specimen from his garden in Cumnor Hill, near Oxford, in 1940 had turned out to be Lempke’s Gold Spot, a species that had only recently been recognised as European at the time of the note. I had no record for Lempke’s Gold Spot on the Berkshire database, and the species is not included in Brian Baker’s book on the county’s moths either, so this could have constituted a new species, the 638th, for the county list – always an enticing prospect! However, the question arises why Baker did not include the record in his book; many of Bretherton’s records were included, and Bretherton’s moth collection went to Reading Museum on his death, the museum for which Baker was natural history curator for many years, and retained an active interest in after his retirement. So I am left wondering whether Baker saw the Lempke’s Gold Spot record or specimen and rejected it, or whether it didn’t get into his book because he was simply unaware of it. The ‘normal’ Gold Spot is very similar to Lempke’s Gold Spot (sometimes needing dissection to distinguish the two), and in Bretherton’s article he states that the specimen was of a worn individual, so there is an element of doubt. What all this adds up to is that, unfortunately, the verdict has to be “not proven”, and the idea of Lempke’s Gold Spot being a Berkshire moth must remain an intriguing possibility. If only we could travel back to 1940 and have a look round at the habitats then available. The previous post listed some identification keys that run online, as more-or-less interactive websites. This post includes some sites that have keys you can download (usually as pdf documents) and print out. See also my bookmarks on delicious. Some excellent materials, many produced by Brian Eversham, are available on the website for The Wildlife Trust for Bedfordshire, Cambridgeshire, Northamptonshire and Peterborough [link updated at October 2012]. These include keys to insect orders, grasshoppers and bush-crickets, water bugs, ants, beetle families, longhorn beetles and soldier beetles (plus other non-insect groups). NB that most of these are tailored to the Bedfordshire area, and do not necessarily include all UK species (the exception being the soldier-beetle one by Dr Mike Fitton, which does have all species). Various resources, including an identification guide to grass moths (Pyralidae: Crambinae) compiled by Nick Asher, can be downloaded from the Berkshire Moth Group. Some keys to selected groups of bees and ants are available from BWARS. Dipterists Forum has produced some really good downloadable keyes, some of which are available only to DF members; these include a very well-illustrated key to Diptera families, a key to Scathophagidae (dung-flies and allies), both of these by Stuart Ball, and a version of Alan Stubbs key to hoverfly tribes illustrated with photos by Stuart Ball – Dipterists Forum is worth joining just for these, let alone all the other benefits! Available to anyone is the set of draft keys to craneflies, by Alan Stubbs, and keys to stilt and stalk flies, by Darwyn Sumner. The recently established Beetle News has included keys to various small groups of beetles in its first few editions, and they can be downloaded from the Amateur Entomologists’ Society. This listing from the FSC includes many of their published keys, available to purchase, but also some older papers that are free to download, including Unwin’s key to Diptera families, and the now slightly out-of-date key to slugs by Cameron, Eversham and Jackson. On Saturday 30 January, Roger Hawkins and I are running a workshop for the BENHS on using keys for insect identification. We’ll mostly be working with published hard-copy keys, but we’ll include some online keys as well. Below are some examples for various invertebrate groups. I must admit that I don’t yet make much use of online keys. This is partly because I’m fortunate in having a good range of printed keys available to me, and I’m sure it’s also partly a case of ‘sticking with what I know’ rather than spending time learning the online ones (all keys require time spent on them to get familiar with their particular approach). However, I think there are still some problems with online keys, from the practical one of having to have a computer within easy view of your specimen or microscope, to more intrinsic issues about the ease of flicking through a book to compare different sections, as opposed to having to switch between different windows on a computer. However, online keys are likely to become more widespread and will no doubt get better as time goes on, just as printed ones have (and continue to do so), and no doubt the two will be seen as complementary rather than an either/or choice. See below for some online keys to try out. For a longer list (including plants and other groups as well as invertebrates) see my bookmarks on delicious, and let me know if there are any other good keys out there, or any thoughts you have on using online keys. A post on downloadable keys will follow. The most comprehensive set of online keys that I am aware of is the DELTA Intkey system. This requires you to download some software onto your computer, after which you can either download various individual keys, or run them from the web. Orders of insects, families of Coleoptera, families of Diptera, genera of Ephemeroptera, families of Hemiptera, families of Hymenoptera, families of Lepidoptera, genera of butterflies, genera of Geometridae, genera of Noctuidae, species of Phyllonorycter, species of Odonata, genera of Orthoptera, families of Trichoptera. These are multi-access keys so that you can answer the set of questions in any sequence, and need only answer the ones you’re confident of – the system will endeavour to give you a best match of one or more names for your specimen. I’ve made most use of the family keys for Coleoptera and Diptera, but I have to admit they’ve not proved as helpful as I hoped, and I still tend to return to paper-based single-access (dichotomous) keys for backup. But it is always good to have additional keys available for comparison, and no doubt if I used them more I’d get more used to their idiosyncrasies and perhaps find them more helpful. There are some draft online keys available on iSpot (part of OPAL), including a simple ‘key to minibeasts’ – this part of iSpot is still under development, and there’ll be more to come. The Watford Coleoptera Group (click on “ID aids”) are making a range of identification aids available, some in the form of keys, some as notes on particular species or groups of species. The Natural History Museum provides a very useful key to bumblebees. These online keys to various families of Diptera are managed by Paul Beuk, who also runs the excellent Diptera.info. You may need to register on Diptera.info to get full access to the keys. Some of these keys are online versions of existing printed keys, others are new (e.g. includes the best key I’m aware of for genus Sylvicola in family Anisopodidae). Not a key, but some very helpful support for keys is provided by the Anatomical Atlas of Flies, from CSIRO in Australia. This is a truly excellent web implementation of a morphology diagram and glossary of names for parts of flies, using detailed close-ups of real insect specimens. But it needs a good broadband connection to work at any speed! Mark van Veen’s Faunist is a Dutch site with keys to various families of Diptera, plus Odonata, Orthoptera and sea-shells. The latter three are in Dutch only, but most of the Diptera keys are in English. They are well-illustrated and easy to use, and I think cover most of the British species in the families included. Plenty of information about the species is given (but remember that this refers to the fauna in Holland, which will include additional species and different habitats/behaviours compared to the UK). Some of these keys to robber-flies (Asilidae) by Fritz Geller-Grimm are applicable to the UK (others cover various parts of the world). For those flies with larvae that produce leaf-mines (largely Agromyzidae, plus a few Anthomyiidae etc.) there are keys based on the foodplant on the excellent UK Fly Mines site. 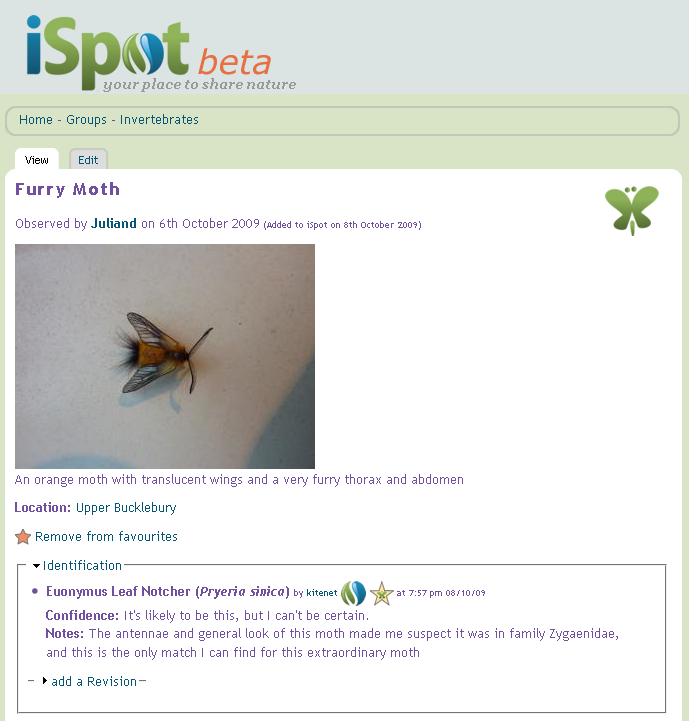 Similarly, for leaf-mines of Lepidoptera try Barry Dickerson’s online key, on the British Leafminers website. This is largely based on volumes 1 and 2 of “The Moths and Butterflies of Great Britain and Ireland”, but with some additions and revisions. A very useful resource (but be aware of all the non-lepidopterous insects that also make leaf-mines, most of which are listed, but not keyed, elsewhere on the site). Butterfly Conservation/Moths Count provide a simple key to day-flying moths. 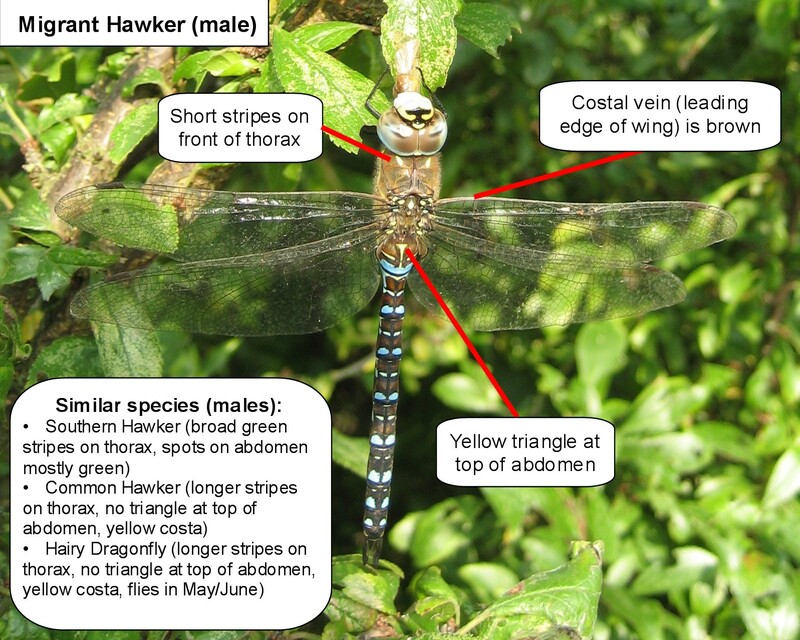 There is a good identification key to Irish dragonflies and damselflies, but it covers males only, and not all UK species are included. The Conchological Society provide some online keys and other identification notes for various groups of snails and slugs. This German website has a key to European spider families. The Moths and Media talk (see below and below) gets another outing on Monday 8 June, 7,45pm, for Wycombe Wildlife Group – all welcome if you’re within reach of High Wycombe, Buckinghamshire. Details are here.